Amber is a graduate of the 3000-hour massage therapy program at West Coast College of Massage Therapy. She is licensed through the College of Massage Therapists of BC since 2011 and is a member in good standing with the Massage Therapists' Association of BC. Amber is also a Registered Yoga Teacher. During a treatment Amber employs a variety of techniques, including myofascial release and trigger point therapy, to address your specific concerns. Amber strives to provide a high level of care especially to expectant mothers looking for prenatal massage to relieve pain during pregnancy. 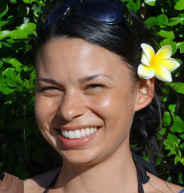 She believes in holistic care for the whole person and is excited to be a part of the Healing Cedar Wellness team. In her free time, Amber loves the outdoors and likes to take "nature walks". She looks forward to building community ties in the Port Moody area.